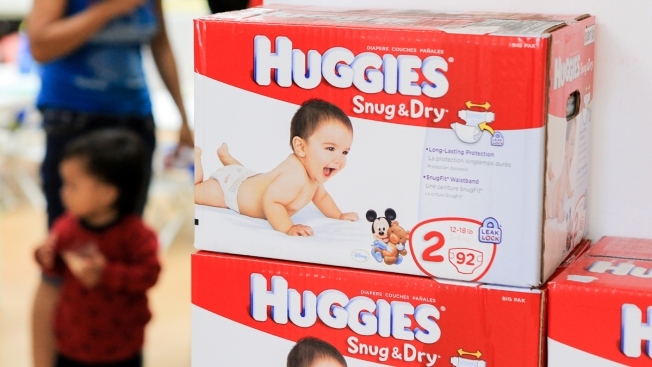 In this file photo, Huggies Snug & Dry Diapers are pictured at the Baby2Baby warehouse on August 21, 2013 in Los Angeles, California. Kimberly-Clark, the maker of Huggies and Kleenex tissues, announced Tuesday it will cut about 13 percent of its workforce globally. Americans are having fewer babies, and diaper makers are feeling the pinch. Kimberly-Clark said Tuesday it will cut as many as 5,500 jobs, or 13 percent of its workforce, in an attempt to lower costs. The job cuts come as the maker of Huggies and Kleenex -- like other consumer-products companies -- is seeing a decline in demand for some core products as U.S. birthrates fall. According to the National Center for Health Statistics, the general fertility rate fell 11 percent between 2007 and 2016. Only provisional data is available for 2017, but it tells the same story: Women under 30 are having fewer children and aren't in the market for diapers, tissue and other products that new parents buy in bulk. "You can't encourage moms to use more diapers in developed markets when the babies aren't being born in those markets," Kimberly-Clark CEO Tom Falk said in a conference call. The Dallas-based company also said that it plans to close or sell about 10 manufacturing plants while expanding production elsewhere. It's also looking to exit or sell some low-margin businesses that make up about 1 percent of company sales. The company did not say where the job cuts would take place. Makers of consumer products are also getting squeezed between higher commodity prices and lower retail prices as shoppers scour the internet for the best deals. While competitor Procter & Gamble also reported earnings that met expectations, analysts showed some concern about the first quarterly price decline since 2011, as well poor diaper sales. Kimberly-Clark Corp. anticipates pre-tax savings of $500 million to $550 million by the end of 2021 from the cost-cutting moves. It foresees total pre-tax restructuring charges in a range of $1.7 billion to $1.9 billion. The company also reported mixed fourth-quarter results on Tuesday. Its adjusted profit of $1.57 per share was 3 cents better than what analysts polled by Zacks Investment Research forecast. But revenue of $4.58 billion was slightly below Wall Street's expectations. Kimberly-Clark's annual sales declined for the three-year period between 2013 and 2016, according to FactSet. But annual sales rose slightly in 2017 from the prior-year period. The company is looking to save more than $1.5 billion between 2018 and 2021 as part of its ongoing cost-savings program. Shares in Kimberly-Clark ticked up less than 1 percent in afternoon trading.